We started by speaking to leaders whose brands were making an enduring cultural contribution—long-term thinkers in our short-term world. We wanted to understand what distinguished them from their nearsighted peers. We found that all brands tend to fall into one of four categories. The first type are commoditized brands. Commoditized brands typically don’t generate any cultural impact or consumer engagement. Think tissues or other paper products. These brands are the most vulnerable because they are the most easily replaced. Then there are trendsetting brands, the second type, which are always coming and going. 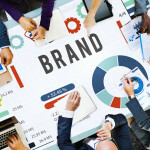 Trendy brands, like celebrity brands, are simply focused on capitalizing on their 15 minutes of fame—so although they engage a lot of consumers, they generally don’t leave a lasting impression on culture. The third type of brands—superiority-based brands—succeed in their category but fail to inspire people’s imaginations. Computer chip manufacturers are a good example of superiority-based brands. 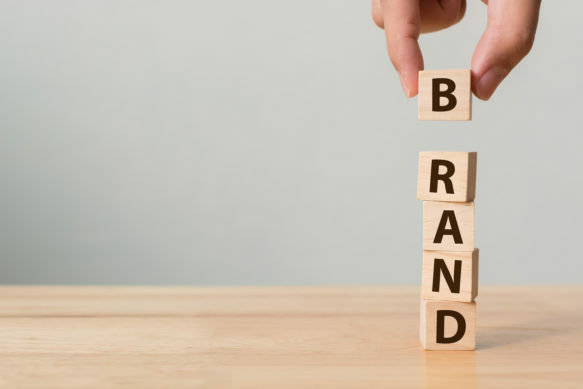 Those in the final category, modern legacy brands, achieve enduring cultural influence by inspiring consumers in the name of making a significant cultural impact. They create the kind of lasting change that makes the world a little better for all of us. These are the brands we chose to profile in the book—from not-for-profits like (RED) and It Gets Better, to entertainment brands like The Tribeca Film Festival and The Bluebird Cafe. Is there any commonality among the brands you chose to profile in the book? 1) Take leadership personally – While short-term thinkers buy in to systems and processes with the goal of following market trends, we discovered that modern legacy builders invest in individuals seeking to make a meaningful contribution. Often, this begins with investing in their own long-term personal ambitions. For example, Reshma Saujani left a lucrative job in the financial services industry and set out to solve a seemingly intractable problem: narrowing the gender gap in computer science. Today, she’s realizing her personal ambition through the organization she founded, Girls Who Code, which is on track to reach gender parity in the field by 2027. 2) Behave their beliefs – The short-term approach to brand-building works from the outside in, operating on the principle that attitude and posturing matter most. Long-term thinkers with the modern legacy mindset work from the inside out, letting beliefs guide behaviors since actions matter more than words alone. Such is the case at The Ritz-Carlton Hotel Company, where employees (or “ladies and gentlemen”) gather at the beginning of each shift to discuss goals and share “wow stories”—exceptional examples of customer service that demonstrate the brand’s beliefs in action. 3) Let outsiders in – Seeking category dominance and sales superiority, short-term thinkers hoard information and try to tell customers what to do. Modern legacy builders do the opposite—growing their social influence by inviting customers to help tell their story and letting sales follow saliency. At (RED), the nonprofit devoted to ending the transmission of HIV/AIDS, this means partnering with brands like Apple, Starbucks and S’well, and their consumers, to release limited-edition products and experiences that people not only want but also feel good about buying because a portion of the proceeds goes to a good cause. 4) Invent their own game – Short-term thinking leads to mastering rules, accepting conventional wisdom, and maintaining the status quo. In contrast, modern legacy builders leverage long-term thinking to break rules and reconcile paradoxes, ultimately forging extraordinary and lasting change. For example, when the engineers and designers at Lexus face a challenge, they spend time deciding how best to frame the question before reflexively jumping to a quick solution. In other words, they solve for the “why” before the “what.” This process of asking ever-smarter, more significant questions is the way the brand produces ever-sharper, more innovative products. 5) Never stop making legacy – Too many short-term thinkers either grow stale by repeating the past or lose their identity by renouncing it. To cultivate enduring significance, modern legacy builders find ways to perpetually bring the past forward. Since 1877, The Championships, Wimbledon has evolved with one ambition in mind: providing the world’s best tennis. Every aspect of the tournament—from players’ all-white dress code (keeping the focus on the game) to the recent addition of a retractable roof over its hallowed Centre Court (ensuring play continues when it rains)— is reviewed annually to ensure the brand is delivering on its long-term ambition. Many leaders are so focused on today that the quarter seems long-term. Thinking beyond that, to a true legacy, seems like a dream. 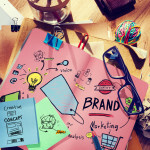 Why is it important for leaders to think about brand legacy even in the midst of this pressure? The fact is, all the pressure for short-term results is actually resulting in shorter and shorter corporate lifespans. We now live in a short-term world, an era where the products we buy often outlast the brands that made them. In the 1920s, the average lifespan of a company on the Standard & Poor’s 500, a list of the 500 most valuable companies traded on the U.S. stock market, was 67 years. Today, that number is 15 years. On average, an S&P company is being replaced every two weeks—meaning that by 2027, an estimated 75% of the S&P index will have turned over. Most of us are familiar with famous brands like Gibson Guitars, RadioShack, Toys “R” Us, and Brookstone. All four of these brands filed for bankruptcy this year. Why? Because they were too focused on short-term survival to navigate the big picture. By thinking about building a legacy and passing it forward, leaders and brands can focus on more than survival. They can focus on thriving for years to come. What story do you find resonating most with your audience? This is a tough one, because we speak to so many different audiences. At an automotive event, the audience might want to hear more about what we learned speaking with Lexus. Musicians want to know more about Taylor Guitars, another brand we profile. Sports, entertainment, social good—we cover a wide and diverse range of categories in the book. One story that resonates with a lot of people is Patagonia, the outdoor gear brand founded by Yvon Chouinard. Chouinard wrote the foreword to our book, and his story captures all five of the transformative principles we described a moment ago. Driven by a desire to leave no trace, Chouinard started out designing better climbing equipment. That personal ambition evolved into clothing with Patagonia, and, over the years, Patagonia has become a vehicle for everything from sustainable food to documentary filmmaking and political movements. The brand is modern legacy in action—inspired by the past, drawn by the future, and continually forged in the present. Let’s just take one. “Don’t be the best, be the only one.” I love that. Give us an example of how this grand goal is accomplished. We love that one, too. Again and again, we were struck by the fact that modern legacy builders are more interested in creating their own categories—that is, being categories of one—than in competing for a share in someone else’s category. This led us to stories like Grey Goose vodka. Distinguishing itself by taste in a category that previously aspired to be tasteless, Grey Goose vodka has flaunted longstanding category norms since its debut more than two decades ago. Not only was it the world’s first “super premium” vodka, it was the first major vodka brand crafted in France. Today, as other brands have followed in its wake, Grey Goose continues to distinguish itself by innovating outside of category norms. Recently, the brand introduced Grey Goose VX, a new line of spirits combining vodka and cognac. For those who know the brand’s history, Grey Goose VX is an artful nod to both the past and the future. Francois Thibault, the cellar master who designed the original recipe for Grey Goose, spent his career crafting cognacs before he helped launch the Grey Goose brand in 1998. The combination of the two spirits to create a never-before-seen third spirit is an example of the innovative, unconventional thinking driving the brands in the book. You end the book with a charge to write your own story. What’s the next chapter for you? It’s a great question, because we do strive to live the values we celebrate in Legacy in the Making. Naturally, we are always looking for leaders and brands for our next book. It’s something we talk about all the time, whether we’re working with a new client or collaborating with any of our various partners in the work we do. On the immediate horizon, we are celebrating the honorees in our New Legacy Makers’ Showcase. This is a program we launched to celebrate and reward the efforts of the next generation of modern legacy builders. It’s inspiring because we’re not only researching and writing about these young leaders—among them, social activists, coaches and mentors, and a filmmaker—we’re also investing in them financially, so we’re actually taking part in the good they are doing and helping to advance their long-term personal ambitions. Along the same lines, we are ramping up The Legacy Lab Foundation, a nonprofit we created in partnership with The Giving Back Fund. 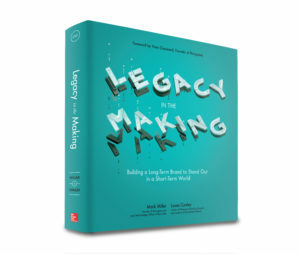 The Foundation enables us to contribute a portion of the proceeds from each book we sell to the leaders we recognize as part of our New Legacy Makers’ program. It’s an exciting new chapter in The Legacy Lab’s story that we’re particularly proud to share. For more information, see Legacy in the Making: Building a Long-Term Brand to Stand Out in a Short-Term World.